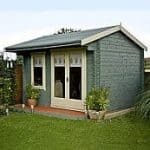 This is a real statement piece and is elegant, stylish and sophisticated in looks so will be sure to add some drama to your garden. 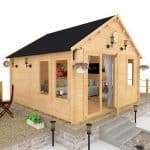 You will be delighted if you purchase this ranch style outbuilding, as it will more than fulfill your expectations such is its superior design and craftsmanship. 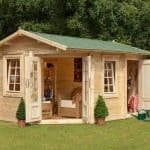 The Kingswood Log Cabin has very large proportions and it’s own porch and terrace so it’s almost like an additional house! 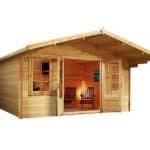 It is the ideal entertaining log cabin as there is plenty of space inside and outside. 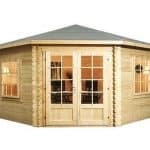 There are large double doors with glass panes and functional windows so there is plenty of light, air and ventilation. 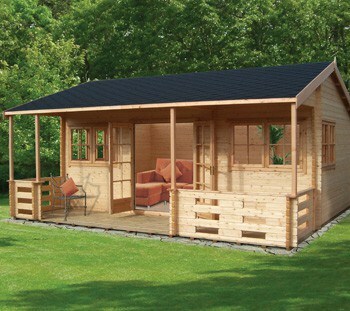 The Cabin has plenty of room for outdoor entertaining too so you can enjoy some warm evenings on its terrace. 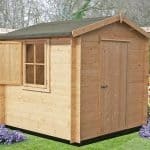 It is constructed out of hard wearing and long lasting wooden timber and is a real beauty with its smart Apex style roof. This Kingswood building comes home delivered only and assembled for your convenience.